Beginning in 1893, the Texas Longhorns football program is one of the most highly regarded and historic programs of all time. From 1937 to 1946 the team was led by Hall of Fame coach Dana X. Bible, and then from 1957 to 1976 the team was led by Hall of Fame coach Darrell K Royal, who won three national championships. The first championship was in 1963 and the second was in 1969. In 2012, the football program was valued at $805 million, more than the calculated value of several NFL teams. In 2008, ESPN ranked Texas as the seventh-most prestigious college football program since 1936. As of the end of the 2018 season, Texas' all-time record is 908–370–33 (.705), which ranks as the second-most wins in NCAA Division I FBS history. Texas is known for their post-season appearances, ranking second in number of bowl game appearances (55), fourth in bowl game victories (29), most Southwest Conference football championships (27), and most Cotton Bowl Classic appearances and victories. Other NCAA records include 108 winning seasons out of 122 total seasons, 24 seasons with 10 or more wins, 9 undefeated seasons, and 26 seasons with at most one loss or tie. From 1936 to 2012, the Longhorns football teams have been in the AP or coaches' rankings 66 out of 76 seasons (86.8% of the time), finishing those seasons ranked in the top twenty-five 48 times and the top ten 28 times. Texas claims four Division I-A national championships (1963, 1969, 1970 and 2005) and 32 conference championships (3 Big 12 Conference, 27 Southwest Conference, and 2 Texas Intercollegiate Athletic Association). A total of 129 (53 consensus and 22 unanimous) Texas players have been named to College Football All-America Teams, while two Longhorn players, Earl Campbell (1977) and Ricky Williams (1998), have won the Heisman Trophy, college football's most prestigious individual honor. Seventeen Longhorns have been inducted into the College Football Hall of Fame, while four are enshrined in the Pro Football Hall of Fame. Texas has been affiliated with four conferences and twice been an independent. Texas has been selected national champion in nine seasons from NCAA-designated major selectors. :107–109 The 1963, 1969, 1970, and 2005 championships are claimed by the school, while the remainder are not claimed. Texas has won 32 conference championships, 26 outright and six shared, spanning three conferences, the Texas Intercollegiate Athletic Association, the Southwest Conference, and their current conference, the Big 12 Conference. Texas has won a share of 7 Big 12 South titles, 5 of which resulted in an appearance in the Big 12 Championship Game. Texas is 3–2 in those appearances. As of 2011, the new ten team Big 12 Conference ceased to have divisions and conference championship games. ^ The 2006 Rose Bowl was both the Rose Bowl Game and the sanctioned BCS National Championship Game, after that season the BCS NCG became a separate game unaffiliated with the major bowl games. † The Bluebonnet Bowl in Houston was discontinued in 1988, but was replaced by the Houston Bowl (2000–2001) and the Texas Bowl (2006–current). ‡ The Freedom Bowl merged with the Holiday Bowl in 1995. Texas has played in four Bowl Championship Series games (including two BCS National Championships) and one New Year's Six bowl. Texas also played in two Bowl Alliance games (the precursor to the BCS): the 1995 Sugar Bowl and the 1997 Fiesta Bowl. There have been 30 head coaches since the inaugural team in 1893, with Tom Herman being the current head coach. The Longhorns have played their home games in Darrell K Royal–Texas Memorial Stadium (formerly just "Memorial Stadium" and "Texas Memorial Stadium") on Joe Jamail Field since 1924. The stadium is located on the campus of The University of Texas in Austin, Texas. The current official stadium capacity is 100,119, making it the second largest football venue in the state of Texas, the largest in the Big 12 Conference, the fifth largest on-campus stadium in the NCAA, and the seventh largest non-racing stadium in the world. The stadium has been expanded several times since its original opening, and now includes 100,119 permanent seats, the nation's first high definition video display in a collegiate facility nicknamed "Godzillatron," and a newly renovated Joe Jamail Field with FieldTurf. The current DKR-Texas Memorial Stadium and Big 12 attendance record was set on September 15, 2018 against USC with 103,507 spectators. The final planned phase of the stadium's expansion includes the construction of permanent seating and an upper deck in the south end zone, completely enclosing the playing field. The stadium's seating capacity is expected to reach 112,000 once the south end zone is fully enclosed, which would mean DKR-Texas Memorial Stadium would surpass Michigan Stadium as the largest football stadium in North America. However, the date of the final construction phase to fully enclose the south end zone has not been set nor have any funds been raised. Varying sources claim this phase may not take place for upwards of 10 to 15 years, though on March 11, 2014 an announcement was made that an exploratory committee has been formed regarding the expansion of the stadium in conjunction with the construction of the Dell Medical School on campus. Before the Longhorns football team moved to DKR, they played their home games at Clark Field from 1894 to 1924. Clark Field was a wooden-structured stadium located on the University of Texas campus. The Longhorns last game at Clark Field before moving to brand new Memorial Stadium occurred on October 25, 1924. The Longhorns battled the Florida Gators to a 7–7 tie that day. Texas has a long-standing rivalry with the University of Oklahoma. The football game between the University of Texas and Oklahoma is commonly known as the "Red River Rivalry" and is held annually in Dallas at the Cotton Bowl. Dallas is used as a "neutral site" since it is approximately midway between the two campuses. The stadium is split, with each team having an equal number of supporters on each side of the 50 yard line. Texas state flags fly around the Longhorn end of the stadium and Oklahoma state flags fly around the Sooner end. This border rivalry is often considered to be one of the top five current rivalries in the NCAA. The Red River Shootout originated in 1900, while Oklahoma was still a territory of the United States, and it is the longest-running college-football rivalry played on a neutral field. Since 2005, the football game has received sponsorship dollars in return for being referred to as the "SBC Red River Rivalry" (changed to AT&T Red River Rivalry in 2006 after SBC merged with AT&T), a move which has been criticized both for its commercialism and its political correctness. The University of Texas holds its annual Torchlight Parade during the week of the Red River Rivalry. In 2005, the Dallas Morning News did an opinion poll of the 119 Division 1A football coaches as to the nations top rivalry game in college football. The Texas-OU game was ranked third. The game typically has conference or even national significance. Since 1945, one or both of the two teams has been ranked among the top 25 teams in the nation coming into 60 out of 65 games. Twice Texas has defeated the Sooners a record eight straight times from 1940–1947 and 1958–1965. One of the most significant meetings was in 1963 with Oklahoma ranked No. 1 and Texas ranked No. 2, the game won by Texas 28–7 en route to their first officially recognized national championship. The series has also had its share of games that came down to the wire and comebacks most recently in 2009 when Texas cemented a 16–13 victory in the fourth quarter over OU. The game has also been the result of controversy. The meeting in 1976 was a heated affair as the Oklahoma staff was accused of spying on Texas' practices, a move later confirmed by former OU head coach Barry Switzer. In the 2008 season Texas scored 45 points over then No. 1 Oklahoma for the win, but even with the victory Texas would not go on to the Big 12 Championship game due to BCS rankings. Six of the last ten showings featured one of the participants in the BCS National Championship Game (2000, 2003–2005, 2008, 2009), including national titles won by Oklahoma in 2000 and by Texas in 2005. On October 6, 2018 the Longhorns and Sooners squared off in a Red River Rivalry game that will go down in history. After giving up a 21-point 4th Quarter lead, the Longhorns found themselves tied at 45 with the Sooners with just over two minutes left to play in the game. As the Longhorns began to systematically march down the field, time began to run out. However, a Cameron Dicker 40 yard field goal sealed a 48–45 win for the Longhorns and finally ended the 2-year drought in the Red River Rivalry. Texas leads the all-time series 62–46–5 as of October 2018. The first meeting between the Texas Longhorns and Texas Tech Matadors (as the team was known until 1937) was in 1928, a 12–0 win for Texas. The teams only faced each other nine times before 1960 with Texas holding an 8-1 record over Tech at the time. From 1960 to 1995, both schools played annually as members of the Southwest Conference. Since 1996, both schools have played as members of the Big 12 Conference. 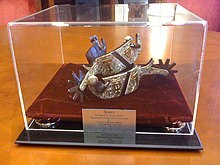 In 1996, the Texas Tech University System was established and the system's first chancellor, John T. Montford, a former member of the Texas State Senate, started the exchange of a traveling trophy between the two universities called the Chancellor's Spurs. The spurs are gold and silver and engraved with Texas Tech's Double T and Texas' interlocking UT logo and were first awarded to Texas after a 38-32 victory over the Red Raiders in Lubbock. Texas leads the all-time series 50–17 through the 2017 season. Old Southwest Conference rivals, Texas and Arkansas first met in 1894, a 54–0 blowout by Texas. In the days of the Southwest Conference, the game between the two schools usually decided which team would win the conference championship. Overall, Texas won the game about 71% of the time, which led to an incredibly fierce and intense rivalry. The two programs have met 78 times, with Texas holding a decisive 56–22–0 advantage, and have had many big games. The meeting in 1969 is the true Game of the Century commemorating the 100th year of college football, which led to the Longhorns' 1969 national championship. This game still does not sit well with Razorback fans to this day. The game saw Arkansas lead throughout only to have Texas come from behind and win in the final minutes, 15–14. The game also saw former President Richard Nixon attend the game and crown the Longhorns the National Champion in the locker room. Although the 1969 Texas-Arkansas game is also commonly known as The Big Shootout, it has not been played annually since Arkansas's departure from the Southwest Conference to the Southeastern Conference in 1991. However, many Longhorn and Razorback fans still consider this matchup an important rivalry. Texas and Arkansas played in September 2008, with Texas winning, 52–10. Texas and Arkansas also played in the 2014 Texas Bowl, which was won by Arkansas, 31–7. Texas and Arkansas have a scheduled regular season meeting in the 2021 season. Texas leads the series 56–22 through the 2017 season. Texas leads the series 10–4 through the 2017 season. The first meeting between the football squads of the University of Texas and Texas A&M was in 1894, a 38–0 win for Texas. In fact, Texas won its first seven games against the Aggies, all of them by shutout. By 1915 Texas held a 15–4–2 advantage against the Aggies. The game was a back and forth affair for the next twenty years as the home team usually took the victory in the game, however Texas still maintained the series lead. In 1940, Texas shutout the Aggies 7–0 and kept them from receiving the Rose Bowl bid that year. From that year forward Texas would go on to win thirty-three of the next thirty-eight games over A&M. It was not until the mid-1980s that A&M developed a win streak over Texas and in the late 1990s and 2000s the rivalry would again go back to Longhorns. The Texas/Texas A&M rivalry has given rise to several stereotypes on both sides: Texas A&M is generally portrayed as the rural smaller school while Texas is portrayed as the urban-wealthy larger school. With the exception of the 1994 game, when A&M's probation restricted the Aggies from being televised, the annual football game with Texas A&M traditionally takes place on Thanksgiving Day or the day after each year. This iconic in-state rivalry is often considered one of the top college rivalries of all time. In July 2011, Texas A&M elected to join the Southeastern Conference beginning in 2012, as the Aggies wanted to get out from under Texas' shadow, as reported by many alumni. The move to switch conferences resulted in the ending of the 118-year rivalry game between the two schools. On November 24, 2011, Texas faced Texas A&M in College Station in the final scheduled meeting of the rivalry as of January 2019. Texas defeated Texas A&M 27-25 on a last second field goal to win the final meeting. In an attempt to generate more attention for the rivalry in sports other than football, the two schools created the Lone Star Showdown in 2004. Essentially, each time the two schools meet in a sport, the winner of the matchup gets a point. At the end of the year, the school with the most points wins the series and receives the Lone Star Trophy. Texas leads the series 76–37–5 through the 2018 season. Texas leads the series with TCU 63–25–1 through the 2018 season. The University of Texas has had 129 Longhorns selected to the College Football All-America Team including 53 Consensus and 22 Unanimous; Texas also has 17 players and coaches that have been inducted into the College Football Hall of Fame. As of 2016, the Texas Longhorns have had 570 All-Conference Player selections since 1915, including 292 in the Southwest Conference and 278 in the Big 12 where Longhorn players have been named 78 times to the first team and 65 to the second team. 317 Longhorns have been drafted into the NFL, including 43 in the 1st round. As of March 11, 2017[update], The Longhorns currently have 22 players active on NFL rosters. The 1893 team did not always wear orange. They also wore gold and white uniforms. In 1895, the Texas Athletic Association moved to orange and white colors. In 1897, the Association moved to orange and maroon to save cleaning costs. The Cactus Yearbook at the time listed the University colors as either gold or orange and white until the 1899 Cactus declared the University colors to be gold and maroon. Students at the University's medical branch in Galveston (UTMB) were in favor of royal blue. By 1899, a UT fan could have worn any of yellow, orange, white, red, maroon, or even blue. The Board of Regents held an election in that year to decide the team colors. Students, faculty, staff and alumni were asked to vote. 1,111 votes were cast, with 562 in favor of orange and white. Orange and maroon received 310, royal blue 203, crimson 10, and royal blue and crimson 11. For the next thirty years, Longhorn teams wore bright orange on their uniforms, which faded to yellow by the end of the season. By the 1920s, other teams sometimes called the Longhorn squads "yellow bellies," a term that didn't sit well with the athletic department. In 1928, UT football coach Clyde Littlefield ordered uniforms in a darker shade of orange that wouldn't fade, which would later become known as "burnt orange" or "Texas orange." The dark-orange color was used until the dye became too expensive during the Great Depression, and the uniforms reverted to the bright orange for another two decades, until coach Darrell K Royal revived the burnt-orange color in the early 1960s. For the 2009 Lone Star Showdown, the Longhorns wore a Nike Pro Combat uniform. Colt McCoy hands the ball to Jamaal Charles. From 1961 to 1962, the Longhorns' helmets featured the individual player's number on the side in burnt orange above the "Bevo" logo, which was also in burnt orange, with a large burnt-orange stripe down the middle of the helmet. The burnt-orange stripe was removed in 1963 and the helmet featured only the burnt-orange Bevo logo below the player's number, which was also in burnt orange.In 1967, the team abandoned the individual player's number above the logo, and moved the burnt-orange Bevo logo to the center of the helmet's side. With the exception of the 1969 season, this remained the team's helmet design until 1977.In 1969, the helmet design commemorated the 100th anniversary of the first college football game. The player's number was replaced by a large burnt-orange football above the Bevo logo. Inside the football was a white number "100" that indicated the anniversary year. Bevo – the school mascot, a live Texas longhorn steer present for football games and other special events. It is a common misconception that the mascot's name came from Texas students altering a 13-0 branding a group of Aggies gave the steer. In actuality, Bevo received his name several months before the Aggies could vandalize the steer in a Texas alumni magazine. His name came from the slang term for a steer that is destined to become food, beeve, and in a common practice for the 00's and 10's, an "O" was added at the end, similar to Groucho or Harpo Marx. Announced schedules as of May 16, 2018. ^ "Darrell K Royal–Texas Memorial Stadium at Joe Jamail Field". Texas Longhorns. Retrieved August 11, 2016. ^ "(PDF)" (PDF). University of Texas Athletics. ^ a b "All-Time Results". University of Texas. Retrieved October 5, 2017. ^ a b c d e f g h i j 2017 NCAA Football Bowl Subdivision Records (PDF). The National Collegiate Athletic Association. July 2017. Retrieved August 22, 2018. ^ Bianco, John (2014). 2014 Texas Football AdvoCare V100 Texas Bowl Guide (PDF). University of Texas at Austin. p. 120. Retrieved August 22, 2018. ^ "National Championship moments: 1969 Football - Texas Athletics". Texas Athletics. ^ "All-Time Results". mackbrown-texasfootball.com. Archived from the original on November 1, 2010. Retrieved December 11, 2009. ^ "Texas Longhorns Football All-time Results". University of Texas. Retrieved October 5, 2017. ^ "2017 Texas Longhorns Media Guide" (PDF). TexasSports.com. Texas Longhorn Athletics. p. 169. Retrieved December 31, 2017. ^ "A-to-Z Football Fan Guide". Texas Longhorns Official Athletic Site. Archived from the original on December 11, 2008. Retrieved December 12, 2008. ^ Note: The official capacity of Kyle Field is 82,600. Source: "Kyle Field". Texas A&M Athletics. Archived from the original on February 4, 2007. Retrieved March 6, 2007. The record attendance at Kyle Field was 87,555 (November 23, 2001 vs. Texas). Source: "Kyle Field Attendance Records (since 1970)". Texas A&M Athletics. Archived from the original on April 3, 2007. Retrieved March 6, 2007. ^ Note: the official capacity of Nebraska's Memorial Stadium is 81,067. Source: "Memorial Stadium". NU media relations –. Retrieved March 12, 2007. ^ "Longhorns choose Daktronics for HD video display". Mackbrown-texasfootball.com. Archived from the original on June 12, 2008. Retrieved December 12, 2008. ^ "Magician kept UT-OU at Cotton Bowl". DallasNews.com. Dallas Morning News. April 20, 2007. Archived from the original on September 30, 2007. Retrieved 2007-10-30. ^ "Column: Rivalries spark college football". The News Record. University of Cincinnati. Archived from the original on July 13, 2012. Retrieved June 15, 2006. ^ "Torchlight Parade". MackBrownTexasFootball.com. Archived from the original on June 16, 2007. Retrieved July 11, 2006. ^ Davis, Brian (October 7, 2005). "UT-OU : Best Rivalry?". Dallas Morning News. Archived from the original on September 30, 2007. Retrieved July 11, 2006. ^ "Red River Rivalry All Time Scores". Cfbdatawarehouse.com. Retrieved October 11, 2018. ^ a b "Texas vs. Texas Tech All Time Scores". Cfbdatawarehouse.com. Retrieved October 11, 2018. ^ "College Football Data Warehouse". cfbdatawarehouse.com. Retrieved October 11, 2018. ^ "Lobbyist to become Texas Tech University System chancellor". Houston Chronicle. ^ a b HARTZ, MARLENA. "Texas Tech chancellor reclaims spurs from Texas – Lubbock Online – Lubbock Avalanche-Journal". lubbockonline.com. ^ Schaeffer, Rick. Game of My Life: Memorable Stories of Razorback Football. ISBN 978-1-58261-988-0. ^ "Texas Longhorns vs. Arkansas Razorbacks football series history". College Football Data Warehouse. ^ "Texas vs. Nebraska All Time Scores". Cfbdatawarehouse.com. Retrieved October 11, 2018. ^ a b "Texas vs. Texas A&M All Time Scores". Cfbdatawarehouse.com. Retrieved October 11, 2018. ^ "Winsipedia - TCU Horned Frogs vs. Texas Longhorns football series history". Winsipedia. ^ "All Conference Players". MackBrown-TexasFootball.com. Archived from the original on December 17, 2010. Retrieved December 8, 2010. ^ "All-Conference". University of Texas Athletics. ^ "Texas in the NFL Draft". MackBrown-TexasFootball.com. Archived from the original on November 25, 2010. Retrieved January 3, 2011. ^ a b "Burnt Orange and White". MackBrown-TexasFootball.com. Archived from the original on December 13, 2009. Retrieved December 22, 2008. ^ "Official website of the Texas Longhorns – Texas Football". MackBrown-TexasFootball.com. 1917-02-12. Archived from the original on 2012-07-01. Retrieved 2012-06-24. 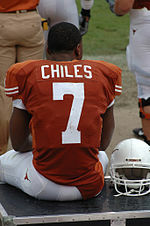 ^ Proud Traditions: Hook 'em Horns Archived 2006-06-26 at the Wayback Machine Mack Brown Texas Football. ^ "Future Texas Football Schedules". FBSchedules.com. May 16, 2018.